New Life in Spain: Cadaqués - ahhhhhh! So, this weekend it was time for my first trip out of Barcelona. I have heard so much about all these pretty small towns and villages around Barcelona and there are a few that are high up on my list, so I thought I'd better get to it! Mr Salvador Dalí. I have always loved his surrealistic work, and I really wanted to see this town where he spent his summer holidays as a child, and where he later settled down (well, almost: he built a house just outside of Cadaqués). It was supposed to be so so beautiful and I was getting very curious to see it. Other artists such as Pablo Ruiz Picasso, Joan Miró, Antoni Pitxot, René Magritte, Federico García Lorca, and more also spent time there. The atmosphere, the bars and the restaurants are so artsy and I loved it! 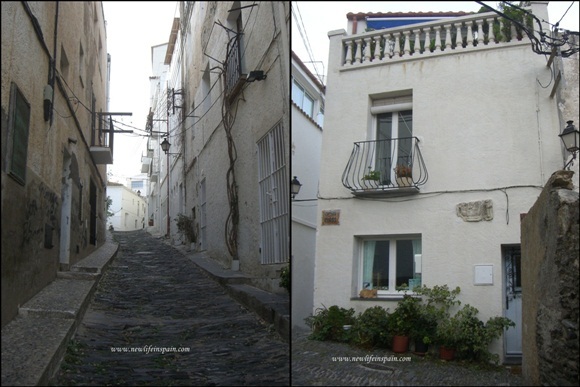 It is a small whitewashed fisher-village, and just plain idyllic and beautiful, with narrow, cobbled streets and a very laid-back feel. Fresh, so fresh fish! Lubina, and tuna. And also so beautiful at night! The town is located on Costa Brava, the coast north of Barcelona, a couple hours drive away, and quite close to the French border. I definitely want to come back here! I also visited Port Lligat, and the house of Salvador Dalí which is now a museum. I might tell about that in another post! Det så utrolig koselig ut ! oh wow!!! What an incredible place! And the history is just breath-taking. Very jealous of you right now! Wow! If these photos are anything to go by, your guest post is going to be AMAZING! // Hehe, ja, jeg jobber i avisa! Har praksisplass der nemlig :D Veldig artig, lærerikt og spennende!